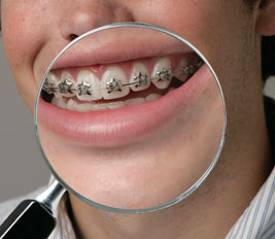 With traditional metal braces, that’s all you get – metal braces. With WildSmiles, you can choose your favorite shape and mix the brackets with colored elastics for added individuality and a completely customized experience. WildSmiles braces transform your smile into a work of art! WildSmiles are creating a BUZZ in the world of orthodontics. The patented designs can be mixed and matched to give everyone a truly unique smile. WildSmiles was founded in 2000 after a patient visited Dr. Stevens’ office in Omaha, NE wearing a heart shaped pendent necklace. “Why couldn’t this be a Bracket?” With this thought, WildSmiles Braces were born!! They now are available in Star, Heart, Soccer Ball, Flower, Football and Super-Diamond®shapes. Now kids and kids at heart all around the world are wearing WildSmiles Braces during Orthodontic Treatment. WildSmiles are the #1 shaped brackets in the world and have remained at the top since their creation in 2000. WildSmiles braces work the same as traditional braces. The part that attaches to the tooth (the Pad) is in a fun and unique shape. Pick one of five fun shapes to help you create your truly unique smile. You can mix them with colored elastics for added individuality. So choose the colors of your favorite football team to wear with your WildSmiles Football or Soccer Ball shaped braces! WildSmiles are for your front six teeth on the Upper Jaw.This way you are able to show them off to your friends when you smile!